A city situated one day's journey north from Jerusalem (Ma'as Sheni, v. 2; Beẓah, 5a, where the spelling is ). It is probably identical with Akrabattene mentioned by Josephus ("B. J." iii. 3, § 5), which in the years preceding the destruction of Jerusalem was the scene of many sanguinary conflicts between the Judeans and the Samaritans. The Munich manuscript and early editions have (Akrabat) for (Akrabah). 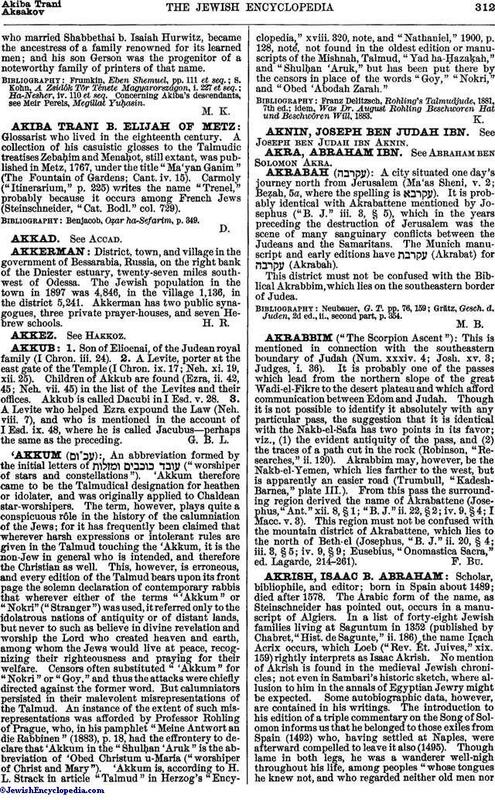 This district must not be confused with the Biblical Akrabbim, which lies on the southeastern border of Judea. Grätz, Gesch. d. Juden, 2d ed., ii., second part, p. 354.